Think you’re a pool shark? Click here to play! Got what it takes to beat the best? 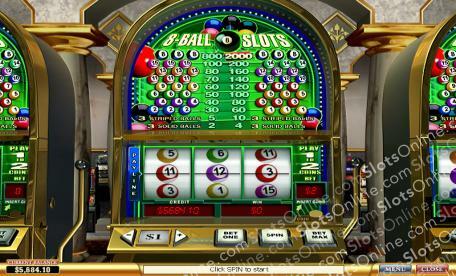 Then take the challenge of 8-Ball Slots, where being behind the 8-Ball is the best place to be. Line up enough striped balls or enough solid balls to win, or better yet, match three similarly numbered balls to pull off a massive upset. Get three 8-Balls to control the table and come away with as much as 2,000 times your bet! Line up your break shot with a bet of $0.05 to as much as $10, and aim for total table dominance from the very beginning. It’s up to you to sink the balls you need for the big wins, as the 8-Ball Slots feature one payline and no free spins or bonuses. It’s a classic slots set up for a classic game, for the true spirit of a game of pool in the comfort of your own home. Taking the bigs or the smalls doesn’t matter in the 8-Ball Slots. As long as the same kind of balls get hit on the same line, winners knock balls into their pocket along with big winnings. Forget missed turns for missed shots �' in 8-Ball Slots, it’s always your turn and you’re always on the verge of winning it all.